Water is a big problem in the drought-prone state of Rajasthan in northern India. And for people like Pura Lal Devaji, a man who makes his way in the world as a small farmer, having a well of his own is key. When you are supporting a family of seven on two hectares (roughly five acres) of land, you have to be able to irrigate. In the monsoon season, Devaji raises maize (corn), soybeans, lentils, and oilseed which can use the rain. When the rain stops, he grows wheat, barley, mustard and other vegetables. 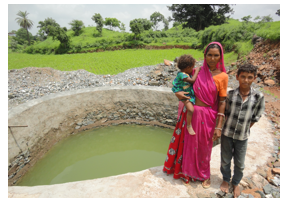 And when the rain stops, open dug wells are the only source of irrigation (and often drinking water) for small holder farmers in arid areas around Akola village, where Devaji and his family live. His and other wells in the region are filled by underground water during the monsoon period. That’s why Devaji submitted a proposal to the Sanwariya self-help group, of which he is a member, to renovate his well in 2013. Sahyog Sansthan supports the self-help group with training to enhance the livelihoods of struggling farmers, who collectively save and loan money to each other. Sahyog also provides small grants to support groups’ community-initiated projects. 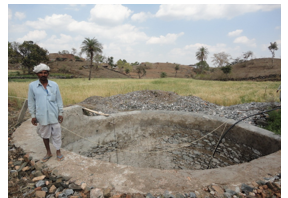 Devaji knew that to improve irrigation to his crops, the well would need to be more efficient. It needed masonry of a parapet wall and a small outlet for directing the water at an estimated cost of 75,000 rupees, or approximately US$1,200. The self help group discussed and considered Devaji’s renovation proposal and in May 2014, recommended it to Sahyog for financial support, even though Devaji’s accumulated savings in the group at that time only amounted to US$70. With help from Sahyog staff, the self help group conducted a feasibility study and a cost-benefit analysis and then discussed the proposal further. Devaji’s fellow self help group members finally approved the renovations on cost sharing basis, with Devaji making a commitment to cover 40% of the costs, with support from the self-help group. He took a loan of an additional US$55 from the group, which they report he is paying back regularly. An additional US$440 of the total cost was contributed by Devaji’s fellow members. The remaining balance for the renovations of $660 (coming in US$100 under budget) was provided by Sahyog using Thousand Currents funding. In October 2014, Devaji harvested his first wheat crop. With the renovated well, it was a bumper crop of 800 kg (1,760 pounds) of wheat, which will ensure the availability of food for his family for many months to come. With the profits from his increased production, he is now planning for more vegetables in the coming season. Water is life, and Devaji knew that with just a little help from his community, he could take this important next step for his family. With help from Thousand Currents, Sahyog was happy to expand Devaji’s and the self help group’s efforts. When people identify what will help them grow best, it is our duty and our privilege to respond.